The Peace and Neutrality Alliance will host Ian Chamberlain of the UK’s Stop the War Coalition and Irish Nobel Peace Prize winner Mairéad Maguire at the meeting in Dublin this afternoon. Roger Cole of Peace And Neutrality Alliance pictured at a press conference last year. IRISH ANTI-WAR CAMPAIGNERS are to hold a public meeting today to drum up opposition to military intervention in Syria and plan to protest at the US Embassy if any air strikes take place. The Peace and Neutrality Alliance (PANA) will host Ian Chamberlain of the UK’s Stop the War Coalition and Irish Nobel Peace Prize winner Mairéad Maguire at the meeting in Dublin this afternoon. Organisers claim that Stop the War Coalition played an instrumental role in the ‘historic’ decision by the UK parliament not to give Prime Minister David Cameron a mandate to engage in military action. PANA say that opinion polls in both the UK and France have shown a majority opposition to military action and the group say they have commissioned a Red Sea poll to gauge the mood of the Irish public. If I was them I’d have a really good look at what’s happening in Iraq and look what’s happening in Libya, the place is falling apart. If you look at the real world that I live in, these interventions don’t work. They leave the situation having intervened much worse than they were. This war will be an illegal war. 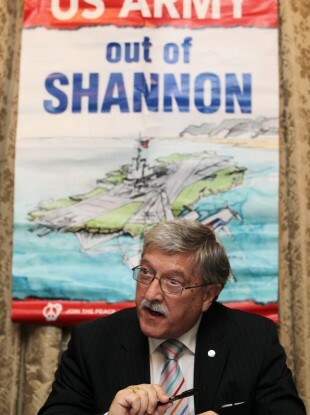 I haven’t heard anyone ask Eamon Gilmore, “In the event of this war, do you accept that this is an illegal war and will you stop the United States of America using Shannon Airport?” Armaments will be passing through Shannon Airport on the way to this war. The PANA public meeting will take place at Connolly Books on Dublin’s Essex Street at 3.30pm. Email “Irish anti-war activists to hold meeting ahead of planned protest ”. Feedback on “Irish anti-war activists to hold meeting ahead of planned protest ”.